Don’t miss this fresh, charming brick Colonial on Van Buren Avenue in West Hartford Center! The welcoming entry opens to a front-to-back living room with gas fireplace. Beyond the living room a den overlooks the back yard through a large picture window. The updated kitchen has stone counters, custom backsplash, an apron sink, Viking/Sub-Zero appliances, and a butler’s pantry that leads to the oversized dining room with wainscoting. A rear deck and powder room complete the main level. Upstairs, the spacious master bedroom includes an en-suite full bath. The second level has three additional bedrooms and a full bath. The top floor is a suite of its own, with a bedroom, wood paneled study (or another bedroom) with fireplace, and third full bath. A walk-out lower level shares space with the attached two car garage. There is a fully fenced area out back that keeps everyone enclosed. The home has hardwood floors, thermopane windows, new gutters, new garage doors, gas heat and lots more. 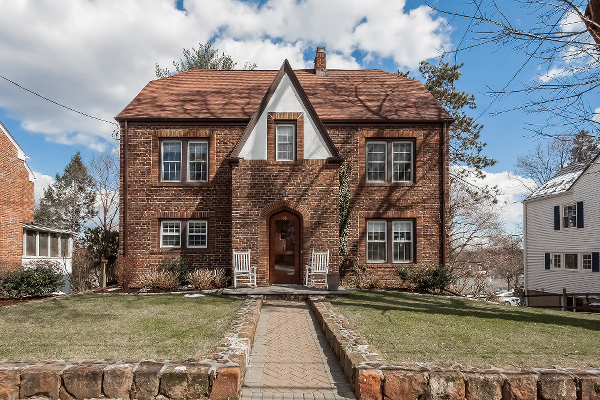 This is a classic 1920’s West Hartford home at its best, and very convenient to the Center! 86 Van Buren is offered at $500,000. If you’d like to see this property, please have your agent arrange a showing or call me at 860-655-2125 to schedule a visit. More details and a photo tour are available.